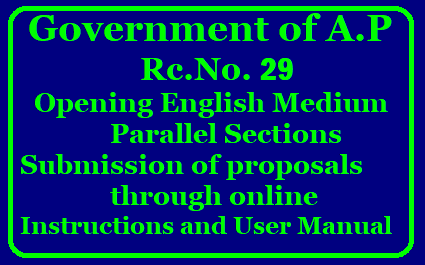 In continuation to this office proceedings under reference 4th read above, all the Regionol Joint D rectors of School Education and District Educational Officers in the State are informed that ths office has developed module for up coding the proposals for opening of English Medium Parallel Sections and the said link is enabled in respectve DEOs and MEOs loginss in the States User Manual enclosed herewith. Therefore all the District Educational Officers in the State are requested to follow the User Manual and upload the information of the schoos for opening of Eng sh Med'um Parallel sect'ons along with the following Resolutions / Declarations of their respect‘ve districts and submit to this office through online only on or before 05-03-2018 without fail. All the Regional Joint Directors of School Education in the State are also requested to pursue the matter with the concerned District Educational Officeers and see that the proposals through online should reach to this off ce within the stipulated time. These instructions should be followed scrupuously.